Henderson, NV � Just outside of Las Vegas, the 2018 Major Series of Putting (MSOP) was held at the Legacy Golf Club during the week of October 22nd. There was money on the line in three main tournaments: the Team Championship, with a $40,000 (~35,000 EUR) purse, the Turbo Singles Championship, with a $40,000 purse, and the Stroke Play Championship, with a $100,000 (~87,800 EUR) purse. Similar to 2017, this year saw a variety of big name minigolfers from around the world competing in various events, including Hans Olofsson, Gunnar Bengtsson and Ricard Lockner from Sweden, Daniel Moser from Switzerland, Daniel Vlcek and Olivia Prokopova from the Czech Republic, Alice Kobisch from Germany, Christian Adler and Patrick Riener from Austria, and Rainey Statum, Gary Hester, Frank Bisesi, Brian Johnson, John Powell and Matt Male from the United States. The Stroke Play Championship was where the big money was at and 76 competitors tried their luck on the course on October 24 -25. The championship consisted of 4 main rounds, after which a cut was made at the top 20 to advance to the final 2 rounds. While not as low scores as the UPMGA Master�s might be, the cut line for the tournament ended up being 126 (31.5 average) and Bisesi and Statum represented the minigolf world going into the final two rounds. The battle for the top spot was close with Benjamin Geyer (USA) in at 118 after 4 rounds and Aaron Crawford (Canada) in at 119. Statum would be close behind at 123 going into the final 2 rounds. Crawford might have felt the pressure but it didn�t show in his results as he fired back-to-back 28s (of which he had 4 over 6 rounds), including acing 7 of the last 9 holes, to move to the top and seal the win and $25,000 (~21,900 EUR) with a 175 (-41). Geyer took second and $12,500 (~10,900 EUR) and Statum would round out the podium with a win of $10,000 (~8,800 EUR). The MSOP put together a short recap video of the tournament on their Facebook page. 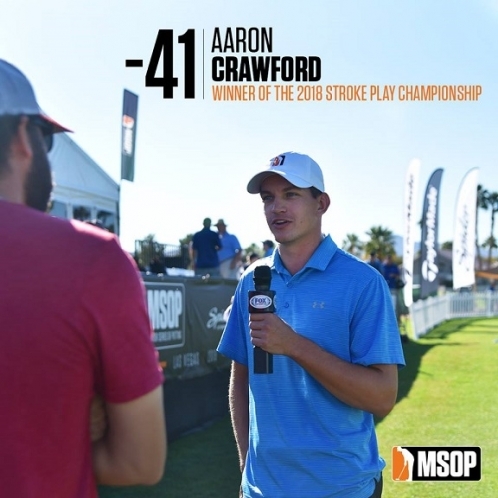 Crawford, who is only 24, would have a very successful 2018 MSOP. To go along with the stroke play win, he would take 1st place in 2 of 3 Mini Turbo tournaments (earning T2 in the third), come in T9 in the Team Championship and T7 in the overall Turbo Singles Championship. His total winning for the tournament was $33,175 (~29,100 EUR) and he would earn the top spot in the Player of the Year points category. Statum, for his part, would keep up an exciting year of putting that started with the 2017 MSOP, cashing in 5 events at the 2018 MSOP, earning a total of $12,185 (~10,700 EUR). In the Turbo Singles championship, held on October 26-27, 84 players attempted to get through 3 rounds to play in the final 4th round. The top of the field saw many minigolfers make the cut but at the end of the day no one could catch David Kargetta (USA) who finished with a 123 (-21), outlasting the field by two strokes and earning $10,000. Hans Olofsson made the best run from the pro-minigolfer community, finishing 6th at 126, behind a backlog of players tied for end at 125 and earning $2,000 (~1,700 EUR). The MSOP also put together a short recap video of the tournament on their Facebook page. The final major tournament of the week was the Team Championship held on October 27-28. This championship covered multiple formats, including best ball and alternate shot, and 64 teams took a crack at getting to the final 4th round. In the end the team of Taylor Montgomery (USA) and Redford Bobbitt (USA) would hold off the field for a 5 stroke win and $10,000, earning that win with a dominating combined 58 in the final round. Statum would team up with Bengtsson in this tournament and international represent the world of miniature golf with a T13 finish and a $1,000 prize (~900 EUR). The full Las Vegas tournament results for all the events can be found here and the major event results have been spiked out below. A congratulation goes out to all in the miniature golf community who played and represented out sport. The partnership with the MSOP has grown exponentially in the last year and we look forward to continued participation in that event. We also hope that many of the golfers who enjoyed their time putting competitive come on over to our major events/tours to continue the fun. Information about the 2019 MSOP will be found on their website .